Currently updating our catalog of questions & answers. Please check back soon. Sclerotherapy is the injection of a needle into varicose and spider veins. The solution within this needle causes the veins to shrink and close. They will gradually disappear. Sclerotheraphy is a quick procedure, lasting around 15 minutes, however depending on how many veins need treatment, you may need a few sessions. What Is EVLT (Endovenous Ablation)? EVLT is a treatment used for large varicose veins in which a thin laser fiber is inserted into the vein via catheter. 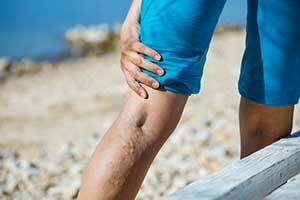 As the doctor pulls out the catheter, the laser shrinks and seals large veins which cause varicose veins. This procedure takes less than an hour and requires local anesthesia. Scarring is minimal if even at all. Phlebectomy means to remove a vein. In this procedure, a micro-surgical procedure, varicose veins are removed through tiny punctures inserted into the vein. This requires a local anesthetic as well. A small hook is used to grab the vein and remove it. This process interrupts the vein which will cause any remaining parts to clot off and eliminate bulgy areas that varicose veins are known to cause.